Well we got the results back from my MRI… yep, I have a torn TFCC in my wrist. What the &! @$ is a TFCC you ask? 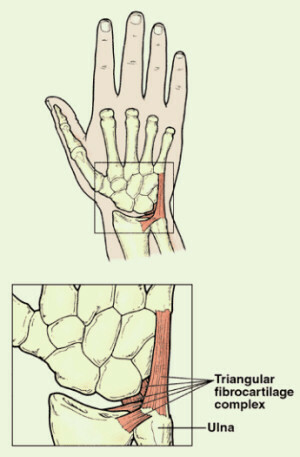 The Triangular fibrocartilage complex (TFCC) is formed by the triangular fibrocartilage discus (TFC), the radioulnar ligaments (RUL’s) and the ulnocarpal ligaments (UCL’s). Don’t worry, I thought the same thing when I read that for the first time also. Tomorrow I’ll hopefully be able to sit down with my physical therapist and ask a few questions (which means a million questions). I also have to have some x-rays of my wrists prior to sitting down with the Ortho doctor. Looks like surgery will be in my near future. The bright side of all this as my Physical Therapist put it… at least you can still run. Well that’s exactly what I did and what I will continue to do. Today we ran 3 miles around the neighborhood. Did a pretty easy pace starting off and then worked the pace up as we went. The run is just what my calves needed from the abuse I put them through this weekend. So my weight lifting is on hold for awhile but I can still run. Good thing I didn’t decide to start a weight lifting blog. ← Welcome to Week Four!